Since we are well on our way into our summer reading books, I wanted a way to keep track of them. Obviously, we'll do several summer reading programs, but those sheets get turned in when the kids claim their prizes. And a notebook log just isn't a whole lot of fun. We did a bit of thinking, a bit of cutting and organizing, and came up with Summer Reading Garland. OK, these are pretty much paper chains, but they are really cute. 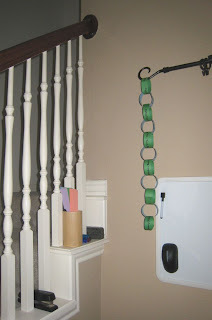 Each link has a title of one of the books the kids have read and they can keep adding on to the bottom. 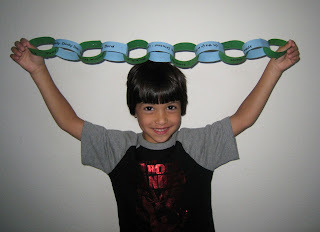 Ben agree to help me out and showed off his first 11 links of his chain. His is blue and green, Faith's is peach and lavender. If you look closely, I do have to help him write the names on the links. He doesn't usually write that small or without lines. The kids are now in a serious competition for who has the most links on their chain. I haven't told them yet that there really is no prize for the winner. Interested in our list of summer reading programs (and other fabulous free/frugal summer fun)? It's all in this post. Great idea! I need to find a way to record my older kids books - they read a lot, and I find it challenging to keep a list. A very creative idea. I love it. I LOVE this idea! The kids just made their reading goals for the summer and this would be a fun way for them to keep up with it. Thanks for sharing!